Abercraf (English: Abercrave) is a village within the historic boundaries of the county of Brecknockshire, Wales, administered as part of the unitary authority of Powys. 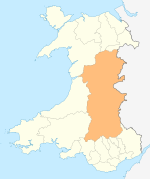 Abercraf lies in the extreme south of the county, in the Upper Swansea Valley 2.5 miles (4 km) northeast of the small town of Ystradgynlais. It is situated just outside the boundaries of the Brecon Beacons National Park and the Fforest Fawr Geopark, which lie to the immediate north, east, and west of the village. A small ironworks was established in 1824 by the local coalowner, Thomas Harper. Its purpose was to exploit two patents granted to Harper and his fellow coalowner, John Christie (also owner of the Brecon Forest Tramroad) in 1823 (no 4848) and 1824 (no 4909) for the use of the local anthracite coal in smelting. The British Iron Company bought the works in 1825 for £19,541 and at the same time leased minerals on the nearby mountain, Cribarth. The venture soon proved unsuccessful and the furnaces were blown out in 1826 after it was discovered that production costs greatly exceeded the selling price. Coal continued to be worked from the taking; it was still in production in 1841 when the local agent gave a statement to the Children's Employment Commission. The coal pits in nearby Caehopcyn ceased production in the 1960s, although the Nant Helen open cast coal mine continues to operate in the region. Abercraf has a number of public houses, a rugby union club (Abercrave RFC), junior/primary school, fire station and a Miners' Welfare Hall, a testament to the village's coal mining past. The Wales Ape and Monkey Sanctuary lies just outside the village. Abercraf lies beneath the slopes of the miniature mountain of Cribarth, famous for its 'Sleeping Giant' outline, clearly visible from the nearby A4067 Swansea to Brecon road. The Giant is formed from a combination of the natural topography of the mountain and, in the case of the Giant's face, alterations to this topography from disused limestone quarries. The Giant's nose is surmounted by a trig point. According to Douglas Adams' 1983 humorous toponymic dictionary of neologisms "The Meaning of Liff", to Abercrave is "To strongly desire to swing from the pole on the rear footplate of a bus". Professional boxer Nipper Pat Daly was born in Abercraf and lived there until the age of five. Professional Rugby Union Player Adam Jones was born in Abercraf. Wikimedia Commons has media related to Abercraf.